Five months of text messages between anti-Trump FBI agents Peter Strzok and Lisa Page have been lost, according to a Friday disclosure from the Justice Department to the Senate Homeland Security and Governmental Affairs Committee (HSGAC), as reported by the Associated Press and the Daily Caller. The missing texts conveniently span the period between Dec. 14, 2016 and May 17, 2017 – the day Robert Mueller was appointed to take over the FBI’s probe of alleged Trump-Russia collusion, and during the period in which the FBI would ostensibly have been hard at work on their “insurance policy” against a Trump victory, alluded to in previous text messages between Strzok and Page. Despite the five months of missing text messages between Strzok and Page, the DOJ turned over a new 384 page trove of new text messages to the HSGAC, according to a letter from Chairman Ron Johnson (R-WI) to FBI Director Christopher Wray (letter below). The new batch of texts are from the spring and summer of 2016 and involve discussions revolving around the Hillary Clinton email investigation – and in particular, former Attorney General Loretta Lynch’s decision to accept the FBI’s recommendation not to press criminal charges against then-candidate Clinton. One exchange references a change in language to Comey’s statement closing out the email case involving Clinton. 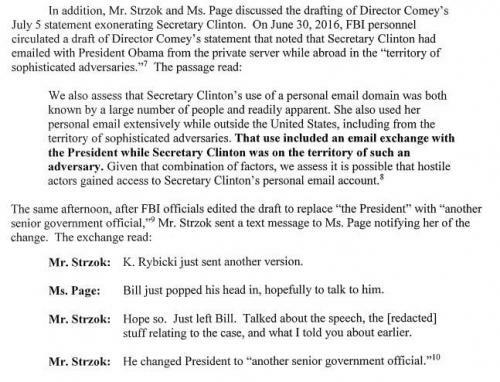 While an earlier draft of the statement said Clinton and President Barack Obama had an email exchange while Clinton was “on the territory” of a hostile adversary, the reference to Obama was at first changed to “senior government official” and then omitted entirely in the final version. In another exchange, the two express displeasure about the timing of Lynch’s announcement that she would defer to the FBI’s judgment on the Clinton investigation. That announcement came days after it was revealed that the attorney general and former President Bill Clinton had an impromptu meeting aboard her plane in Phoenix, though both sides said the email investigation was never discussed. This is also the exchange which troublingly demonstrates that then-Attorney General Loretta Lynch was aware that Comey would not recommend criminal charges in the Clinton investigation prior to Lynch’s announcement that she would accept whatever recommendation the FBI made. Four days later (and six days after the “tarmac” meeting), Comey announced the FBI’s recommendation not to press charges against Clinton. Wiped? Like, with a cloth? Word of the missing texts between Strzok and Page come on the heels of a report we covered yesterday in which the NSA “sincerely regrets” deleting all Bush-era surveillance data it was ordered to preserve. The NSA told U.S. District Court Judge Jeffrey White in a filing on Thursday night and another little-noticed submission last year that the agency did not preserve the content of internet communications intercepted between 2001 and 2007 under the program Bush ordered. To make matters worse, backup tapes that might have mitigated the failure were erased in 2009, 2011 and 2016, the NSA said. 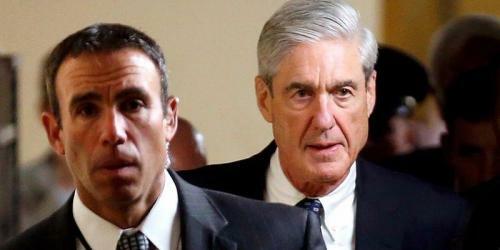 Given the magnitude of malfeasance already uncovered within the top ranks of the FBI during and after the 2016 presidential race, we can only imagine what’s contained within those five months of missing texts between the rabidly anti-Trump FBI employees deeply involved in both the Clinton and Trump investigations. And here is Rep. Jim Jordan.